Happy Valentine’s Day to you! This is a wonderful time of year for a calligrapher. Gentlemen and ladies alike come with their proposals and poems of love, so I know first hand of some of the current Cincinnati romances! Letters, flourishes, colors and gold or silver… you can help me design something unique for your special someone! 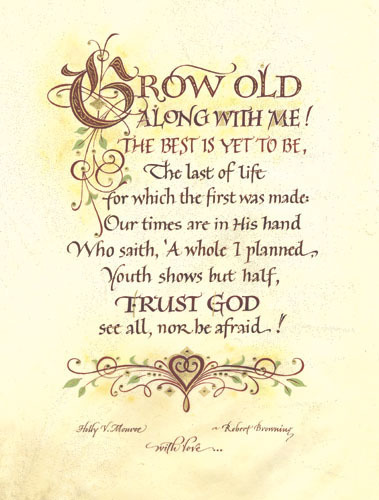 Above is my Grow Old Along With Me print, by Robert Browning. My Falling In Love GREETING CARD was reprinted in November (it’s a best selling print, too) and I restocked some favorite Valentine Cards for Son, Wife, Mom and special Love’s. Papers that my PRINTS are reproduced on have been upgraded to Fine Art paper from the Archival smooth paper! Inks colors are vivid and the detail precise. Your loved ones can keep these fine art calligraphy prints as long as they like. As always, call me to set up a shopping day and let me help you pick out something unique for the people you love!